GRAND RAPIDS’ NEWEST ANTIQUE MARKET! From the organizers of the Vintage Street Market comes Antiques on Ionia: Grand Rapids' newest antique and vintage market! Join us for a Sunday of treasure hunting where you’re sure to find that new piece to complete your collection. 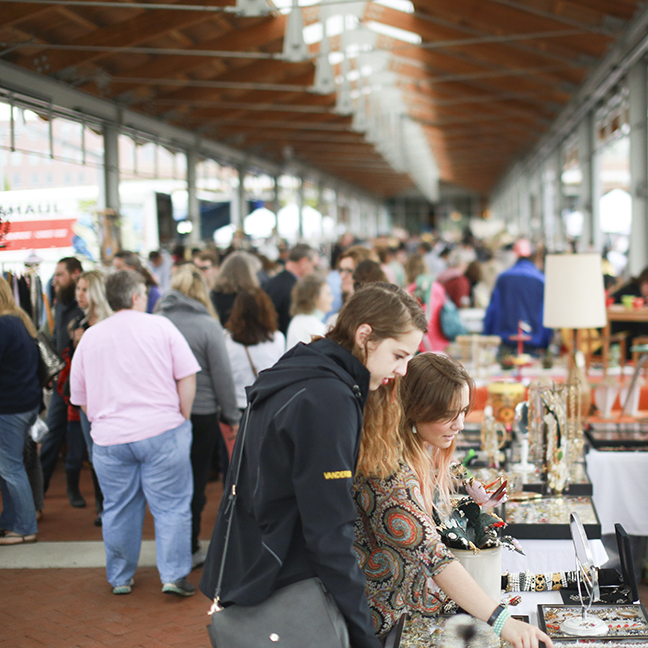 Vintage vendors, décor dealers, and collectible connoisseurs will line the outdoor Market Shed! Click here to learn more about our 2019 vendors. Vendors enjoy free Wi-Fi, electricity, on-site food and beverage sales, clean indoor restrooms, and stalls beginning at only $70 each! ANTIQUES ON IONIA DATES: SUNDAY, MAY 12, 2019 AND SUNDAY, SEPTEMBER 8, 2019.
hours: 10am – 4pm with VENDOR set-up beginning at 8am. Includes both events with an assigned stall and early set-up! Your approximately 26ft deep x 9.5ft wide selling stall will hold up to six 8ft tables. Spaces consist of one parking space (approx. 9ft wide and 18ft deep) with an additional space under the canopy (approx. 9.5ft wide x 8ft deep). You may leave your vehicle in your stall, or park off site to make room for additional selling space. Located along Ionia Ave, island stalls are not covered and do not have access to electricity. Island stalls are approximately 11.5 x 15. Vehicles owners must park off site, island booths do not include space for parking. Tents are welcome however, if you plan to use a tent you must purchase an island stall or TWO shed stalls. This is required as most tents are 10x10, and the shed stalls are only 9ft wide. Download the Rules & Regulations Here.